Previously, on MinerBumping... Agent Ezzemiah Delma spotted a pair of unlicensed miners in a highsec ice anomaly. Incredibly, they were using a jetcan. Ezzemiah took the ice and found his Ishtar on the receiving end of an unprovoked attack by both miners' combat drones. Ezzemiah destroyed the mining vessels and podded KORBAN KARDAMA, the Skiff pilot. Now Ezzemiah was forced to justify her acts of self-defense to KORBAN, who convo'ed her. Ezzemiah Delma > I am not a bully, sir. I am an Agent of the Code. With the patience and courtesy that our Agents are famous for, Ezzemiah addressed all of KORBAN's concerns, one by one. She painstakingly explained the distinction between bullying and Code enforcement. KORBAN KARDAMA > is there any way i can salvage my stuff? As KORBAN's temper cooled, his mind returned--as it always does for miners--to thoughts of his precious money. Ezzemiah Delma > well, about that permit. 10mil isk and lasts for an entire year as long as you remain Code compliant. KORBAN KARDAMA > well i just lost 220 million - cant we call it even? Ezzemiah Delma > Well, It matters to me none, but if you dont have a permit and you continue to operate in highsec, you will be operating illegaly. Ezzemiah Delma > which means you might even get suicide ganked. I dont suicide gank, but many of our agents do. Actually most do. Though a large portion fo the miner's wealth had been wiped out, he couldn't stay angry forever. It was damage control time. How could he prevent further attacks? Agent Ezzemiah had the answers. Ezzemiah Delma > Now I cant speak for thiefs and criminals, but neither The New Order nor its agents will. And you will be safe as long as you follow the Code. KORBAN KARDAMA > but they can still steal it - right? Even rational miners sometimes question whether a New Order permit is a safe investment. Ezzemiah guided KORBAN through the purchase. She was convinced that it was a good idea for KORBAN to send her the 10 million. Ezzemiah Delma > I could consider it a red pen violation, which triples the costs of your permit, but I decided not to. Ezzemiah Delma > and if you want to take a more active role into making highsec a better place, I can point you in the right direction! Ezzemiah Delma > We can always use more agents! Even though KORBAN had tried to kill Ezzemiah and had said some very unfair things about her, Ezzemiah opened the arms of friendship wide. KORBAN remained wary. Ezzemiah Delma > so unless you decide to move to lowsec or nullsec, you wont be safe. KORBAN KARDAMA > so you are telling me that everyone in EVE is paying 10 million to mine in hi-sec? The miner's eyes were opening to the world around him. Slowly, but still opening. Ezzemiah Delma > and as long as they follow the Code, they are safe. Ezzemiah Delma > So would you like to purchase that mining permit now? Ezzemiah Delma > I can otherwise give you a good alternative. You could join KarmaFleet and mine in nullsec, where its safer. The bot-aspirancy had been strong in this miner. For a year, he managed to miss that whole "Code" thing. And Ezzemiah had found him in Kamio, of all places! Presented with the option to travel to scary nullsec, KORBAN recoiled. A New Order permit was the way to go. Ezzemiah Delma > which characters are the permits for? Victory! KORBAN transferred 20 million isk for the permit. Ezzemiah was delighted, though a bit confused by the amount. Was he also buying a permit for his friend in the Procurer--the other miner that Ezzemiah had killed? KORBAN KARDAMA > it goes by character not ship right? Ezzemiah Delma > It is best if that 2nd character gets the mail too so you have proof of purchase. Ezzemiah Delma > who is the 2nd one? 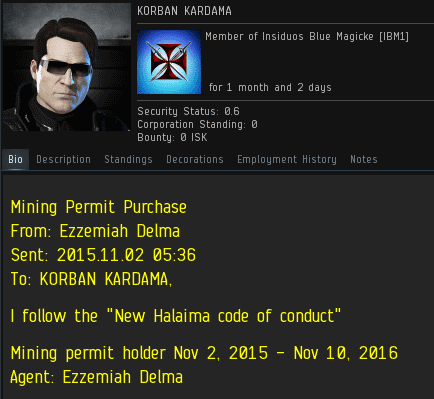 Ezzemiah Delma > Well thank you for becoming Code Compliant, Miner. Make sure you put that in your bio and follow the Code to prevent any further intervention by Agents of the Code. Ezzemiah Delma > Is there anything else I can help you with? KORBAN KARDAMA > how do i highlight this -in my cargo? When the New Order educates highsec miners, we take nothing for granted. It's obvious that no one besides us will help them. If you think our Agents are only out to scam money from miners, think again. Ezzemiah already had KORBAN's isk, but she stuck around to answer more questions. Clearly, KORBAN understood that an Agent was the person to go to for EVE knowledge. Though he owned a permit, KORBAN still showed some lingering symptoms of bot-aspirancy. He hadn't fully accepted the true nature of proper EVE gameplay quite yet. Ezzemiah Delma > well I need to go, so is there anything I can help you with before I head out? Any questions regarding the Code or the Mining Permit you just purchased? KORBAN KARDAMA > Will others know not to squash me? Ezzemiah Delma > I cannot speak for EVERYONE in EVE. Only James 315 can do that, but the Agents of the Code will not shoot at you as long as you do not commit bot aspirancy. Highsec can be a wonderful place, now that the New Order has contributed wonder to it. For the first time, the miner expressed an interest in other players and what they might do to him. He was behaving as though EVE is a multiplayer game. Ezzemiah Delma > That is good to know. Just read the code. All the rules are there and its a good idea to know them to remain a Gallant. Ezzemiah Delma > Well thank you for remaining compliant, miner, and have a nice day! Ezzemiah Delma > Feel free to contact me anytime if there are any questions! 'Twas a great day for Kamio. Ezzemiah realized that none of these extraordinary events would have happened, had the miners not been foolishly using a jetcan for their mining operation. There's a lesson here: When opportunities for player interaction, emergent gameplay, and elite PvP arise, everyone wins. And nobody wins more than the New Order. The New Order wins again! This time, the New Order won when the miner bought a permit and became Code-compliant! Is it even possible for the Code to lose? I've never once seen that happen! The CODE has lost. Liek DarZ, the CODE agent who goes AFK to answer the phone, proving what a hypocrite he, and by extension the Cult of Jamey, truly is/are. If you see any of our Agents AFKing outside of a station, you are free to enforce the Code upon them by deommissioning their vessel. Be advised, though: by doing that, you will reinforce the provisions of the Code, which will only make it win once more. As a consolation, if you don't do that, it will mean that you have failed to intercept an Agent, so the Code wins in this instance, too. Whatever you do, the Code wins, so it would be better for white knights' conscience if they just accepted this objective fact and carried on in peace. Going afk is allowed as long as you do it while docked. James himself has clarified this before. But of course bot aspirants wouldn't know this. Great episode! Kept me on edge. Will he see the light or will it end with another killmail?